I took this photo in a small village along the so-called Ruta Panoramica in central Dominican Republic last summer. We had just spent a night in a wonderful jungle ecolodge called Tubagua, and on the way back to Santo Domingo we stopped in the town of Pedro Garcia to meet with a local Peace Corp volunteer, who was helping farmers convert their land back to coffee after a failed, government-sponsored experiment in raising cattle. Stanley, the Peace Corp kid, was so passionate about his project I couldn’t help but feel inspired, and everywhere we walked with him we were greeted by neighbors inviting him to dinner, joined by teenagers who wanted to practice their English and followed by family dogs that seemed determined to adopt Stanley. 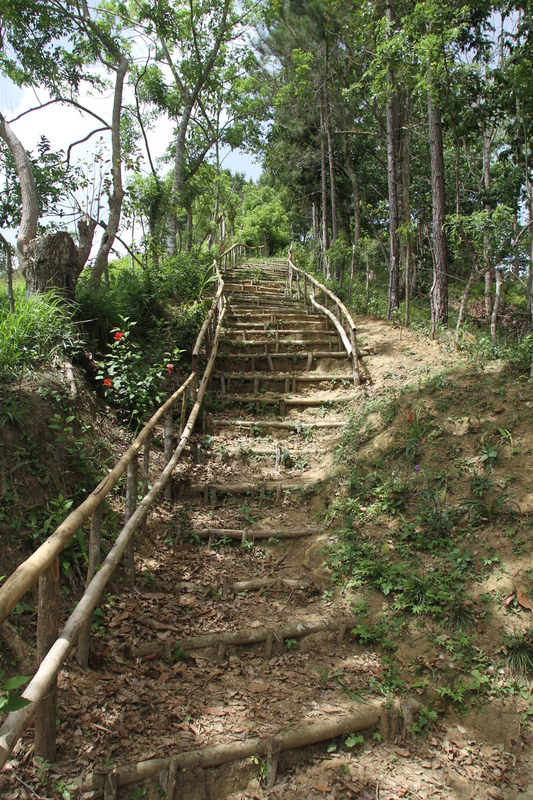 Eventually, we came to these stairs, leading up to a ridge where we had a clear, lovely view of the valley below. The photos from the top where nice, of course. But I prefer this one from the bottom of the stairs—where it’s all possibility and anything might be waiting if you just start the climb. Reminds me of the stairs at Altos de Chavon. Couldn’t walk for 3 days after …. owie!